If you intend to activate Windows Vista against a KMS server (Enterprise or Business edition only), but having a hard time to find a working KMS (Key Management Service) server that is public available on the Internet, it’s possible to install and set up a spoofed KMS host. 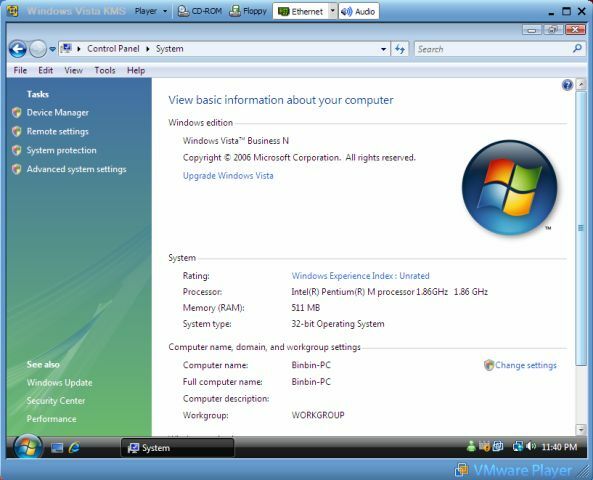 This tutorial is a complete guide to properly activate your Windows Vista with your own local KMS server with pre-built and pre-installed activated Windows Vista KMS as VMWare virtual appliance image, without the need to install a KMS yourself. The following trick instructions incorporate hack that will prevent the time from changing on the spoofed kms server virtual machine image (the KMS inside the image has n count of 41, more than exceed the required limit of 25 for the KMS to start activating the connected Vista PCs), thus ensuring that there will be always 41 activated computers registered in the KMS whenever your copy of Windows Vista try to activate and reactivate. Else the KMS will reduce the n count (the connected Vista clients) by 1 with a Vista computer doesn’t contact or call back to the KMS after 30 days, render the KMS useless as the n count will fall below 25 which means no activation will be done, unless you share out the KMS to the public via Internet. Update: Now there is downsize and streamline version of mini Vista KMS VM image with smaller download size. Install Windows Vista Business edition using the valid product key such as 0UNW0-XXXXX-XXXXX-XXXXX-XXXXX or K2T8M-XXXXX-XXXXX-XXXXX-XXXXX or KTNP5-XXXXX-XXXXX-XXXXX-XXXXX. Once Windows Vista is installed, install VMWare Player or VMware Workstation. Download Microsoft.Windows.Vista.Local.Activation.Server-MelindaGates torrent which contains a spoofed KMS server VM image that are activated and has 41 clients connected on the KMS already to bypass the minimum clients limit (Microsoft.Windows.Vista.Local.Activation.Server-MelindaGates.3572011.TPB.torrent). You will need BT client to download the VMWare image from the torrent. Extract the Windows Vista KMS image downloaded. Or, you can download a already modified and patched Windows Vista (experimental).vmx with required settings to replace the original VMX file. Save the edit .vxm file and exit the text editor. Disconnect from Internet or unplug from the router. Reboot and restart the computer. Once computer boot up, open VMWare software you installed, and choose to open (not run) the Vista KMS server image downloaded. On the right side of the screen, locate the word ‘Ethernet’, and then double click on it. In the option, choose Host only. (You can select Bridged mode if you like to share the KMS server with other computers in the network for activation purpose). Then start the VMWare server to load the Vista KMS server. VMWare Player loading spoofed KMS server. Optionally, disable Windows Firewall in Windows Vista client (your own Vista installation that need to be activated) if you facing any problem. In the VMWare virtual server environment, disable the KMS server firewall too, and then reboot the VMWare KMS server. Determine the IP address of the KMS server in VMware virtual machine, by opening command prompt and execute ‘ipconfig’. Note that the IP addresses of your Windows Vista computer and Vista KMS server have to be located on the same subnet allowed by both subnet masks (e.g 192.168.1.1 ad 192.168.1.2 with subnet mask set to 255.255.255.0). You can check if your computer is able to communicate with KMS server by pinging the IP address of the KMS server. If server is unreachable (ping lost), change the IP address of the KMS server or your Vista computer to be in the same subnet. Right click on Command Prompt icon and choose “Run as Admin” to open elevated command prompt. Windows Vista should be activated with visual confirmation. Stop the VMWare image if you like, but remember to start the KMS server again after 6 months for re-activation.